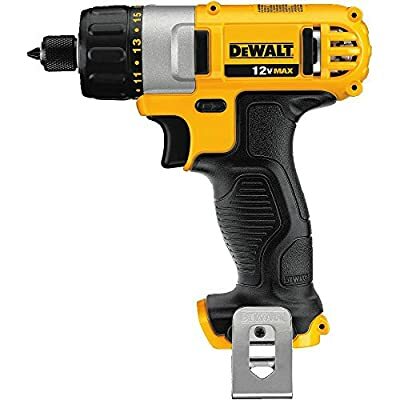 DEWALT DCF610B 12V Max Screwdriver Baretool, 1/4"
Product prices and availability are accurate as of 2019-04-17 18:02:34 EDT and are subject to change. Any price and availability information displayed on http://www.amazon.com/ at the time of purchase will apply to the purchase of this product. The DEWALT DCF610B 12-Volt Max 1/4-Inch Screwdriver Baretool offers a lightweight body and convenient design features. At 6-1/4 Inch long, this screwdriver is designed to fit into small spaces where traditional drill/drivers don't. The shadow-free LED lighting, mounted radially around the barrel, will light your target area for better visibility. This tool also offers one-handed loading and a belt clip. The 1/4-inch chuck accepts bits up to 1 inch, has multiple torque settings, variable speeds and a reverse option. This is a baretool item, battery sold separately.